A basic, bonding primer is adequate for preparing most surfaces for proper paint adhesion. However, because metallic surfaces are slick and non-porous, they require special types of primer to prevent paint from peeling and chipping at some point in the future. 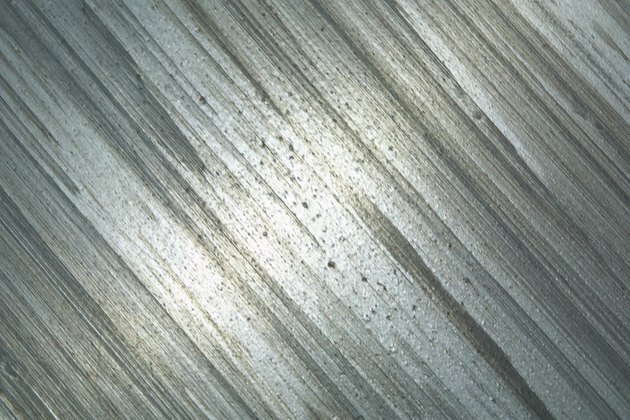 If you plan to paint brushed aluminum, you'll need to use an etching primer to prepare the surface, or the paint simply won't stick. There are a few additional preparation and application steps to address before you begin painting. Scrub the brushed aluminum with water, ordinary dish soap and a coarse brush. Rinse the metal thoroughly. Allow the surface to dry completely before continuing. Pour etching primer into the 1-gallon painter's pot. Fill it to just about one-third capacity. Apply etching primer to the brushed aluminum using the 3- to 4-inch, oil-based paintbrush. Brush vertically, moving from left to right. Apply a light coat. Do not over-apply, as this will lead to runs and drips. Allow the primer to dry and cure for four hours. Pour any leftover etching primer back into its original container. Clean the oil-based paintbrush at least three times using mineral spirits. Clean the 1-gallon painter's pot once with mineral spirits. Apply latex paint to the brushed aluminum in the same manner as you did the etching primer in Step 3. Use a 3- to 4-inch latex paintbrush.